Once a week I like to try out another temporary tattoo nail art design. 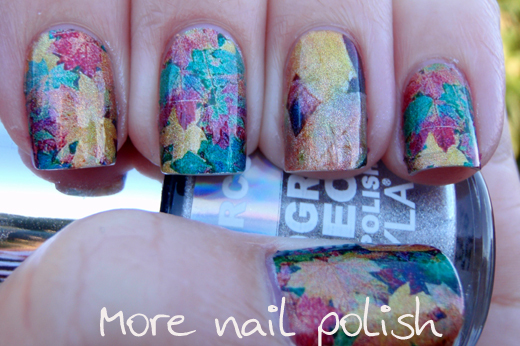 This is a design I put together based on autumn leaves. 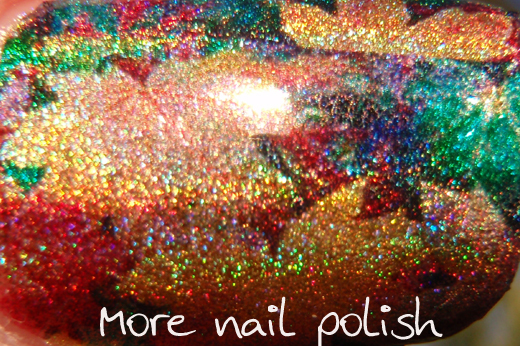 Here is the image I used, which I shrunk down to fit on each nail, then I also printed a larger version for an accent nail. The temporary tattoos were applied over a mani done with two coats of Layla Mercury Twilight. I have to say, the design didn't quite translate onto the nail. 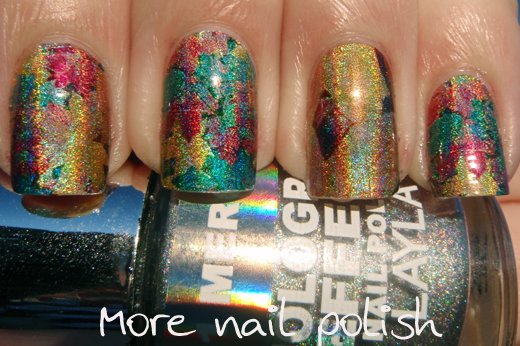 It was certainly pretty and colourful with lots of autumn colours and that stunning holo shimmer, but in the sun you really couldn't tell they were autumn leaves. Even in the shade they were hard to make out, except for my thumb which turned out perfectly. 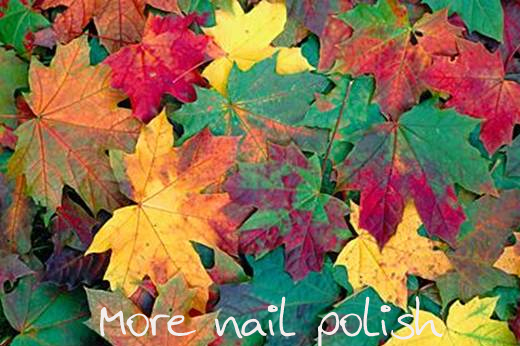 See, lots of multicoloured autumn goodness, that really doesn't look like leaves. Oh well. Just sayin: "craptasitc" :D Don't worry, I've seen faaaaar worse than your spelling. Good god, see I didn't even get through that paragraph without making a typo. But I feel I need to leave it there for posterity. Cool and lol your apology ;) I also printed on tattoo paper but it was a fail :( I just couldn't get the tattoo peeled of the background paper. I thought it was tattoo paper that you had to make wet (similair to decals) but it was peel of tattoo paper. that is insane !! i love it so much!!! I cnduo't bvleiee taht I culod aulaclty uesdtannrd waht I was rdnaieg. Unisg the icndeblire pweor of the hmuan mnid, aocdcrnig to rseecrah at Cmabrigde Uinervtisy, it dseno't mttaer in waht oderr the lterets in a wrod are, the olny irpoamtnt tihng is taht the frsit and lsat ltteer be in the rhgit pclae. The rset can be a taotl mses and you can sitll raed it whoutit a pboerlm. I think it's great that you misspelt craptastic. Hahaha! 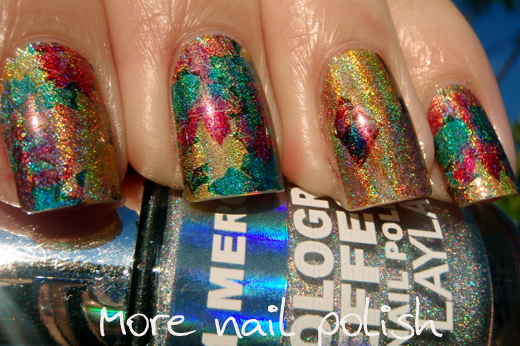 I love colours of this manicure. It looks great in the shade too! Your lovely pictures make up for your spelling and gramatical errors. Lovely nails BTW. 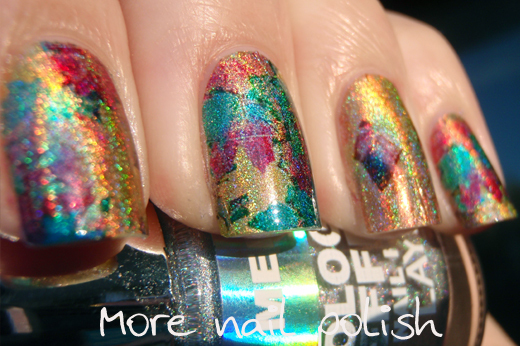 Just keep dazzling us with manicures like this and we won't even notice, I promise you! I agree, I am dazzled and I not be noticin no spelin errorrs. Sorry, sparkly stuff in my eye. I love this method you have with the tattoo paper! The Dragon one has to be an all time favorite. bahaha I love it Cathy, just as long as we know you CAN spell if you want to, that's all that matters :) Thanks for a Friday giggle. Mani is lovely too! OMG Cathy this is awesome! I lived in Vermont so this photo inspiration really hit my heart! I have not tried finding this temp tat paper yet. Something on my bucket list! I think thru look really pretty. OMG this is soo beautiful!!!! great job! I love ur stuff. That's such a good idea. I need to buy me some temporary tattoos and try that! 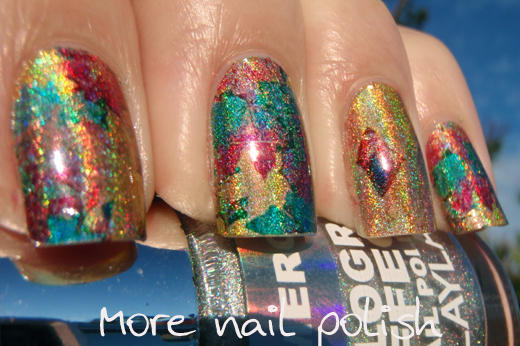 Your nails looks like christmas wrapping paper! Yes, please do a tutorial or tell us how to do the above mani! I love it!!! Please tell us how to do the above mani. Or do a tutorial? It is gorgeous!! !